Today we’re joined by Michael Hellickson, and our focus is the third quadrant in running an effective real estate business; what we like to call cold marketing or prospecting. These are activities that you’re consistently performing with one goal in mind; this is advertising. Michael gives us his best advice about building customer relationships, finding your place and using your skills to your utmost advantage. Building relationships with people is crucial; it can’t always be about the sale. Nurture the relationship and show them how you provide value. As an agent, you need to find your niche and exploit it. 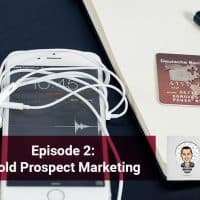 If you’re not sure what that is, Michael suggests getting a coach to help you find out what prospecting activity is the best fit for you. The way that you convert is that you’re essentially writing a check for leads, whether you’re outsourcing them or not. However, there are a ton of ways that you can go out and market aggressively to get them yourself, which you’ll also learn today.